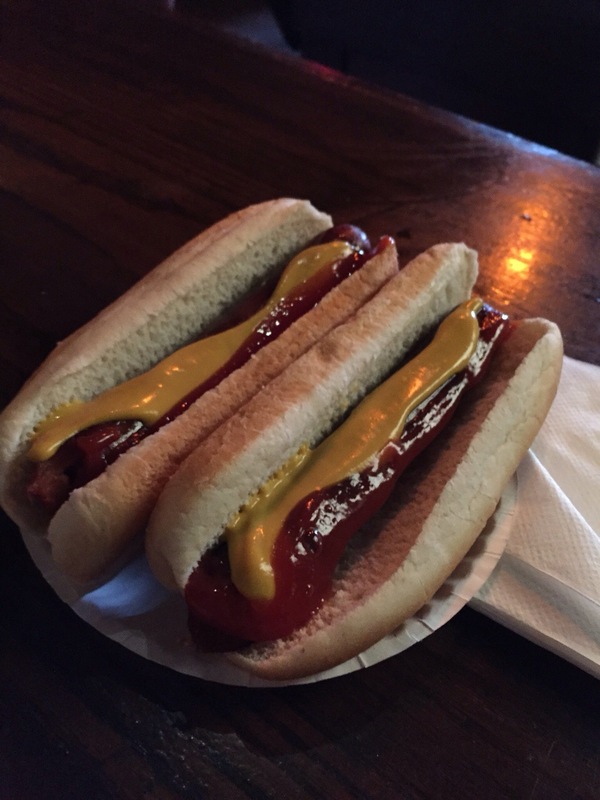 As I begin to type, it is dawning on me that I am actually starting a hot dog blog. Unreal. 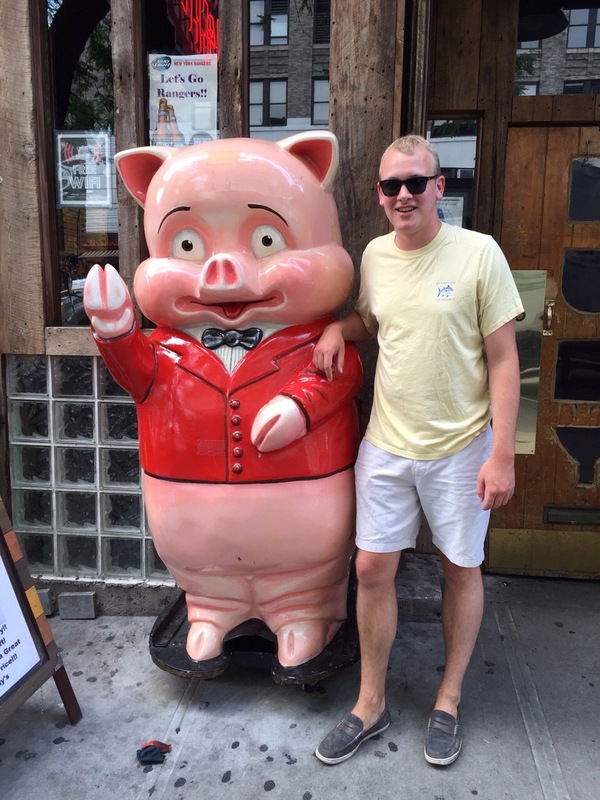 For my first review, I journey to a place I have visited numerous occasions in the past. It only makes sense to me that the first dog I rate is from one of my favorite spots: Rudy’s. 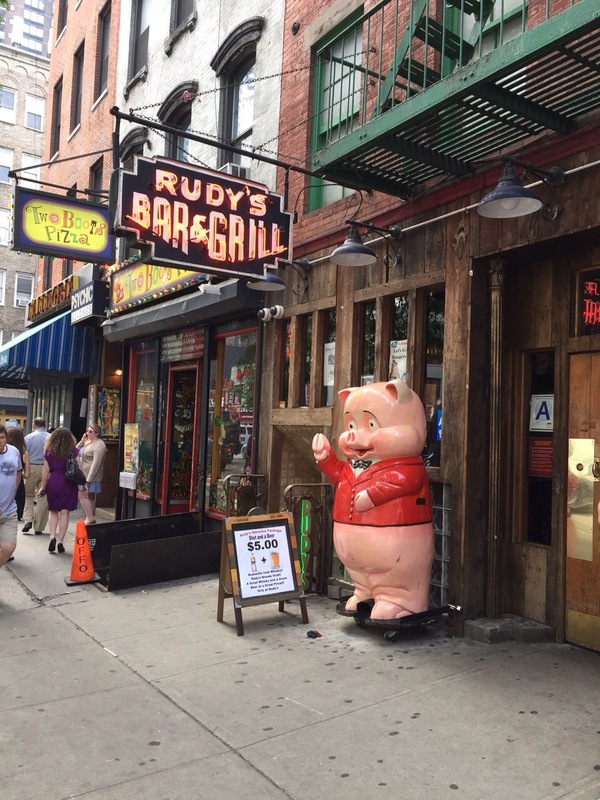 Located in Hell’s Kitchen on 44th and 9th, it is one of the oldest spots around. My friend Mike and I (I always try to eat a dog with a friend) were on our way out east for the weekend and were jonesin’ for a cold beer and a weenie to kick it off. Yes, they have their own beer. But, here’s the greatest, most epic, most God-bless-America part: the hot dogs are free. That’s right, with the purchase of any drink, you receive as many free wieners as you’d like. This is why this bar is one of my favorites. Not only that, but it is super cheap. Each pint of beer is 3 dollars. They have a shot and beer special for 5 dollars. So, if getting hammered and eating hot dogs is your thing, this is the spot for you. Now for the actual hot dog. Behind the bar, there is a 7-11 style rotisserie with a bunch of boys sweatin’ waiting their turn. It reminds me of the physical fitness tests in middle school. None of these weenies want to be embarrassed; they’re getting prepared for the big stage. The only way you can have a dog here is with ketchup and mustard. The toppings are placed on with precision, and the smell overcomes the ghoulish surroundings to put you in a brand new mental state. I take a look at MIke, and with a big smile, its time for the first bite. The dog is good. I’m not going to say it’s wonderful, but it is an unboiled, well-made wiener with a solid personality. He’s dependable. You can count on this guy when you need him. Need to crash for the night because you locked your keys in your apartment? Rudy’s hot dog. Need someone to talk to after your girlfriend dumped you? Rudy’s hot dog. Your momma likes the cat more than you? Rudy’s hot dog. Nothin’ fancy, not trying to impress you, but its good… and its free. The bun is probably not fresh, nor is the dog, but it is probably the best they can do with those ingredients. I am pleased. So, I hereby give a Rudy’s hot dog 3 Weenies. Then, in some sort of twist of destiny, as I leave I notice a sign above the door to the back patio. 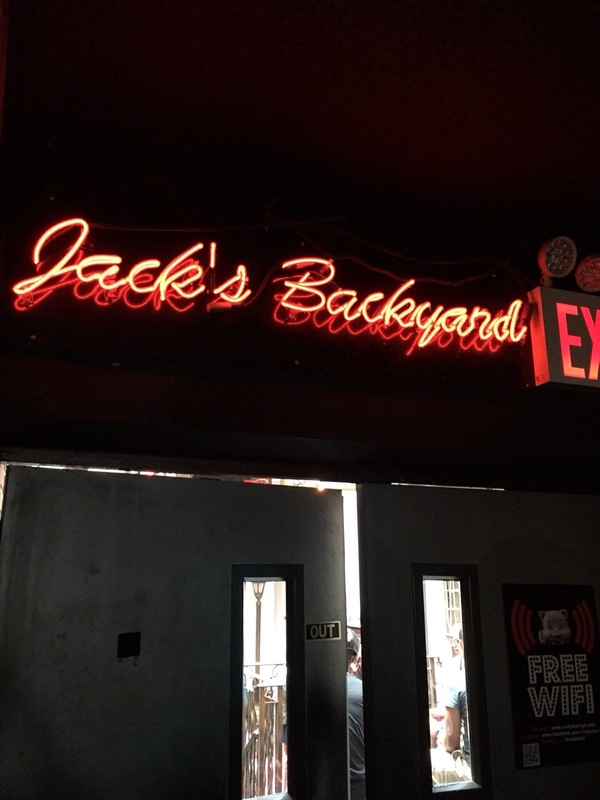 “Jack’s Backyard”. It was meant to be. Cheers. Fake. Definitely photoshopped. You can clearly see the pixels. Excellent looking dawgs; however, some chili would be nice, but it is free with a beer, so no complaints. I’d give the review 3 weenies out of 5. I would have liked to hear more commentary on the beer selection and sides to go with the hotdogs. 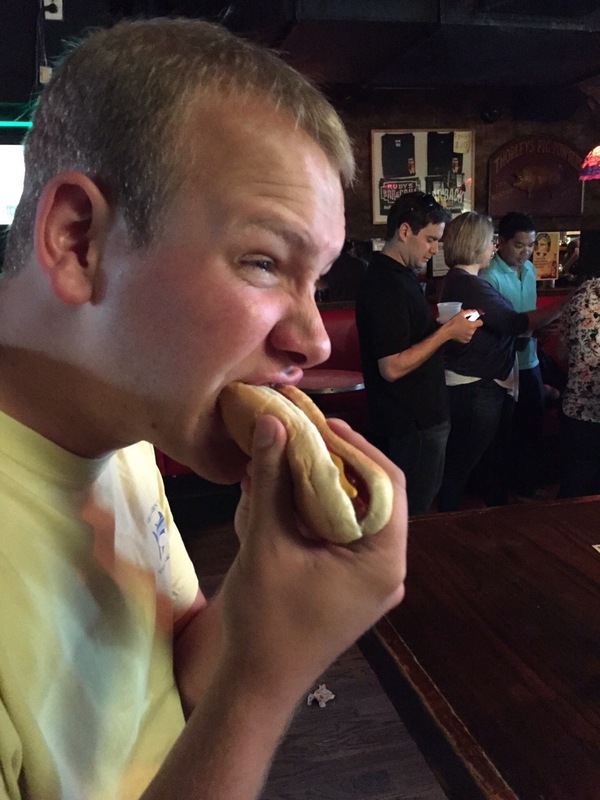 Although the hotdog is the central piece of the meal, food is eaten in context. The best hotdog in the world would taste horrible (imo) if you were eating it something fruity. Per your review, Heather, Katie and I will be posting up here on Friday night to kick off our weekend. Miss you buddy! Join us if you can! !